The paper describes my entry in GBIF's 2018 Ebbe Nielsen Challenge, which you can explore here. I tweeted about its publication yesterday, and got some interesting responses (and lots of retweets, thanks to everyone for those). Hey @rdmpage , really enjoyed reading your Ozymandias paper. Are your assembled triples graphs are available for bulk download? Carl Boettiger (@cboettig) asked where the triples were, as did Kingsley Uyi Idehen (@kidehen). Doh! This is one thing I should have done as part of the paper. I've uploaded the triples to Zenodo, you can find them here: https://doi.org/10.5281/zenodo.2634326. 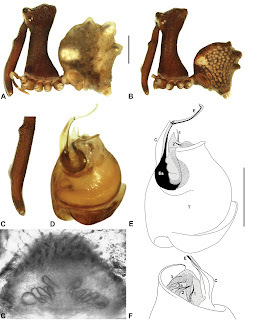 This figure illustrates Austrarchaea nodosa (Forster, 1956), and Plazi has a treatment of that taxon: http://treatment.plazi.org/id/1072F469192A5BA015A1AA70A36E2C92. This treatment comprises a series of text blocks extracted from the paper, so there is not a great deal I can do with this unless I want to parse the text (e.g., for geographical coordinates and specimen codes). So yes, there is RDF (see http://treatment.plazi.org/GgServer/rdf/1072F469192A5BA015A1AA70A36E2C92) but it adds little to the existing knowledge graph. To be fair, for some treatments in Plazi are a lot richer, for example http://tb.plazi.org/id/A94487F7E15AFFA5FF682EE9FEB45F2C which has references, geographical coordinates, and more. What would be useful would be an easy way to explore Plazi, for example, if the RDF was dumped into a triple store where we could explore it in more detail. I hope to look into this in the coming weeks.